1916 is a Brake Standard 'Laminate' coach and is part of the Dublin based 'Heritage' set of coaches. 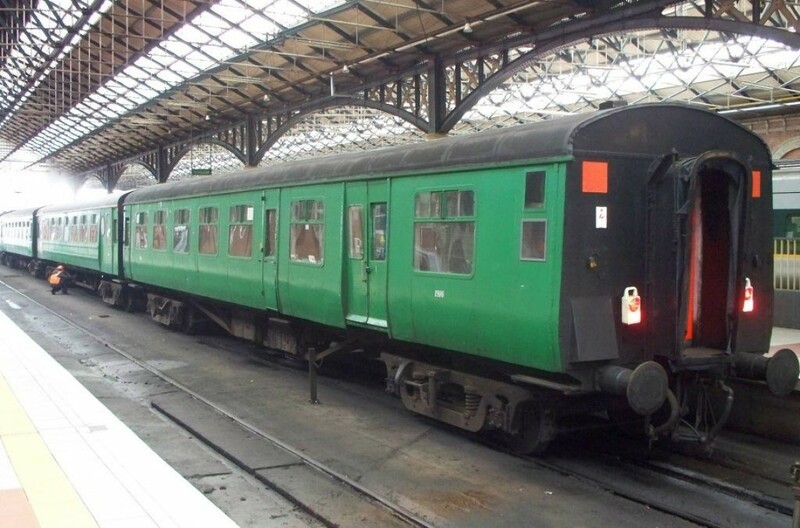 It was originally built by CIÉ at Inchicore in 1956 as suburban composite carriage 2168. When new it would have three doors each side - a door at each end, and one in the centre. Inside a divider separated the First Class section from the Second (latterly Standard) class section. The first class section comprised of five bays of 2+2 seating; passengers in Second had slightly less room being bunched in three bays of 3+3 seating. 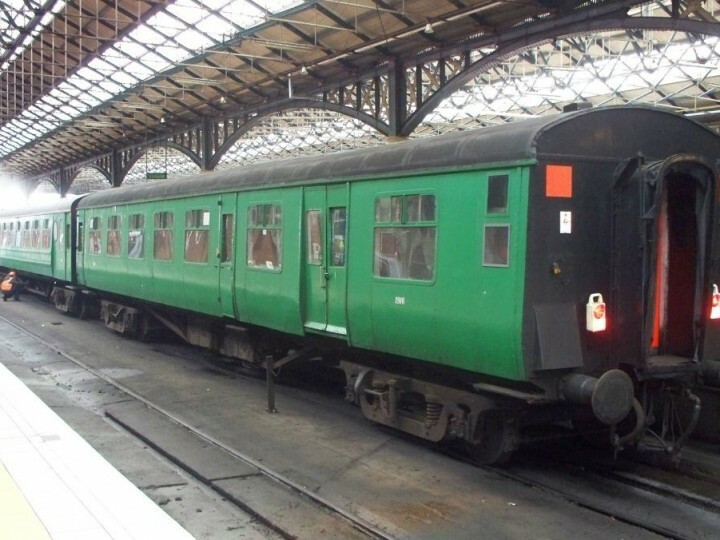 These were part of a series of coaches constructed at Inchicore in the mid-1950s to what was known as a 'Laminate' design, owning to their construction. The Society also owns 1463, which is an example of another batch of Laminates which were built as full Standard Opens. In 1969 2168 was rebuilt, with all seating now becoming Standard class. The revised seating now comprised of three bays of 2+2 and five of 3+3. In 1970 this series of carriages was renumbered in the 16xx series, with 2168 becoming 1603, a number it would bear for around two years, before undergoing yet another identity change. In 1972 these carriages were converted to Brake Standards, and renumbered in the 19xx series - 1603 becoming 1916. As part of this conversion three bays of seating were removed and the space created was fitted out as a brake van. As 1916 she would go on to see over a decade's more service, before being withdrawn around 1986 as CIÉ began to phase out its wooden-bodied rolling stock. 1916 was acquired by the RPSI for preservation, and was overhauled at Mullingar in the mid-1990s when it was also fitted with a 220v generator set to power the Heritage set. It would go on to provide brake and generator facilities for the Heritage set for over a decade. In this time it also saw use in a number of film productions, including "Michael Collins" (1995) and "The Wind That Shakes The Barley" (2005). 1916 was last used to transfer Craven bar car 1514 from Mullingar to Inchicore in late 2010. Currently stored out of service at Inchicore, 1916 is now in need of major overhaul. It is now one of very few of the once numerous 'Laminate' type coaches left, and is thus an important survivor in its own right.